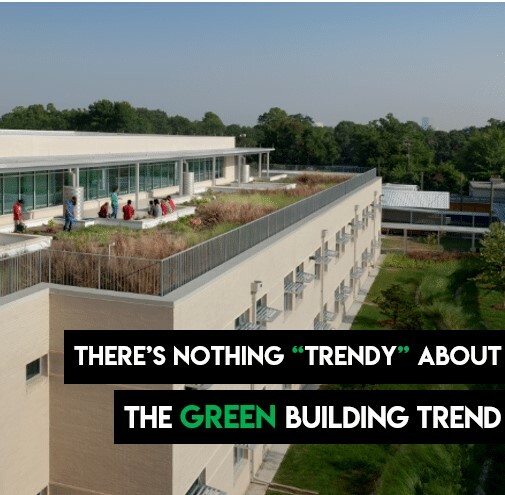 There’s Nothing “Trendy” about the Green Building Trend - Rice & Gardner Consultants, Inc.
“Green.” “Sustainable.” “Eco-friendly.” These words have rapidly become a part of the modern lexicon, applied to everything from the cars we drive to the food we eat. Sometimes they’re used so often it can be hard to remember that they actually are more than just buzzwords – but they are. The environmental challenges the world faces have never been greater or more complex. Soon more than 9 billion people will share our planet; increasing demands for food, water, energy and infrastructure are pushing nature to its limits. The impact of climate change will only continue to magnify as our global population does the same. No industry should be more aware of this than construction – not only is it the top global consumer of raw materials, it also generates between 25 to 40 percent of the world’s carbon emissions. Fortunately, not only has the industry taken notice, it’s taken action – U.S. construction should see an increase in the share of green work in the next few years as a direct result of the growing demand for green buildings. The U.S. Green Building Council (USGBC) recently released its 2015 Green Building Economic Impact Study, which notes that between 2011 and 2014 green building construction generated $167.4 billion in GDP, and was projected to account for more than 2.3 million jobs in 2015. In fact, the green building sector is outpacing the overall construction industry in growth and is estimated to maintain traction into the foreseeable future. As mentioned, companies are looking to set themselves apart and establish themselves in terms of corporate responsibility. Signs telling visitors about a building’s environmental footprint have become common place in lobbies throughout the United States. It’s proven that green building have lower upkeep and lower utility usage costs. Energy and water savings are perhaps the most obvious, and easiest to comprehend, benefits of green certification. Not only are you saving the planet; you’re saving the building owner money. Green Buildings are better for the long-term health and productivity of those who use the building. Occupants who moved from conventional to green office buildings were found to have reduced absenteeism as well as a positive change in health conditions such as respiratory allergies, depression, and stress. These projections show that embracing the green movement is not just responsible business, it’s also good business. Want to find out more about green building, LEED, or the USGBC? Rice & Gardner are experts in sustainability and have LEED accredited professionals ready to answer your questions. Contact us today!